Before we look at complex techniques it's important to know the basics of melting chocolate. If you've ever seen chocolate go grainy or burn in the microwave you'll know that this seemingly simple task can quickly go wrong! But with a few tricks up your sleeve you can ensure smoothly melted chocolate every time. First things first, chocolate likes to be melted slowly. If you're using the microwave, give it very short blasts on a low heat and keep checking on it (tiresome but worthwhile). 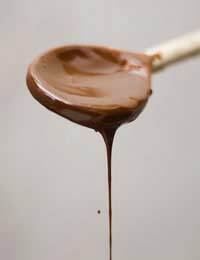 By the time 75% of the chocolate is melted, the internal heat should be enough to finish the remaining lumps - so don't think you need to heat it until it's all smooth. With a double boiler, you can usually bring the water to a gentle boil, put the bowl of chocolate on top and switch off the heat altogether. Secondly, resist stirring the chocolate as it melts. You'll introduce air bubbles which won't produce a smooth result. Finally, remember that chocolate must not come into contact with water or steam. So if you're using a double boiler (bowl set over a pan of simmering water), make sure that the water doesn't touch the bowl and that you don't splash water into the chocolate at all. What does it mean? Tempering chocolate is a way of ensuring a glossy finish and that characteristic chocolate 'snap'. Melted chocolate usually sets to a dull brown, right? But that's because chocolate is temperamental. It doesn't like getting too hot or cold too quickly (like many of us). Take care with it, and you'll get it looking its best. Tempering is a technique that is important when you're making truffles or topping or coating a slab of cake, or a whole brazil nut. In the truffle-making industry, tempering is an important technique. In fact you can buy tempering machines to do the work for you - but at home, a thermometer should suffice. So how do you temper chocolate? You'll need a double boiler (a bowl set over a pan of hot water) and a digital thermometer. Prepare your chocolate first, chopping it into small pieces (about 1cm) and reserve about 1/5 of it. Put the rest into your bowl and allow the water to simmer as gently as possible. Let it melt in its own time - no heavy whisking or beating! Use your thermometer to check and, when it reaches 44-48 degrees C, take it off the heat. Now beat in the remaining chocolate, and keep stirring. Use the thermometer to see when the chocolate temperature drops to 28 degrees C. At this point, return it to your double boiler, where it will begin to warm up again. This time you're after a temperature of 32 degrees C. As soon as it reaches the right point, the chocolate is ready to use. For chocolate curls, you'll need some tempered chocolate - or, if the glossy finish isn't quite so important, you can cheat by melting your chocolate with a little vegetable shortening. (Use 4tsp for a 100g bar of dark chocolate.) Now you've got a dish of molten chocolate, prepare a square or loaf tin with vegetable oil and baking parchment. Pour in the chocolate and allow it to set - now you're ready to begin curling! There are two techniques you can use, although both require some practise and a steady hand. First, if you've shaped your chocolate into a block or loaf tin, then you can use a potato peeler to pare off curls from the slimmest side of the block. Alternatively, if you've poured your molten chocolate onto a tray, then you can use a knife. Draw it along the surface of the chocolate and scrape a thin layer, which will curl as you bring the knife closer toward you. Don't panic here - experiment with different utensils and try creating different shapes. A lemon zester makes a great set of chocolate twists! Before adding them to your dessert, let them firm up properly. You know how to produce spectacular finishing touches: now put them to good use - you can find exciting recipes for cakes and desserts using the menu on the left!